Standing at the very top of Jerusalem’s historical market, I am overwhelmed by the noise, smell and sights that surround me. I take my first steps towards the stalls, full to the brim with fresh produce, inviting me in to take a look. As I move in closer, the words ‘’come, come & taste "בוא, בואו וטעם" echo in my ears, as every stall holder is ready to pounce with a mouthful of the delights he has on offer, so as not to let you wander off without buying. Intoxicated by the smell of garlic wafting through the air, my eyes are drawn to the large pink bulbs piled high, having recently been trimmed from the discarded leaves that lie under the table, only to be cleared away after the market is finished for the day. I glance across the market and immediately the array of vibrant colours of the fruit and vegetables entice me to stroll over to view what is on offer. Punnets of large bright red strawberries sit next to shiny orange mandarins who in turn share the row with green and red apples, all vying for attention, but it is the proud looking pomegranate that I focus on, with its pinky red, slightly blemished skin, larger than any pomegranates I have ever seen. 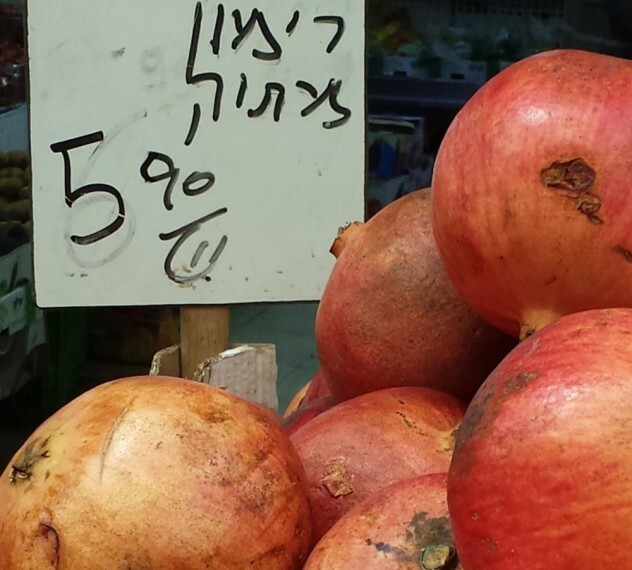 I am captivated; I put my hand in my bag and reach for my purse…..my first purchase is a pomegranate, a fruit steeped in Jewish tradition, the symbol of wisdom and for a mere 5 shekels and 90 agurot or £0.99, it will add little red pearls of sweetness to my salads. I wander further into the midst of the bustling market and stop by a stall selling truffles of the foraging kind, where a middle aged man is explaining to one and all their culinary uses. I can’t but help feel that his efforts are wasted on these buyers, but tomorrow is another day in Machane Yehuda and maybe a truffle will be a sold to a chef who wholly realises the true value of this quality ingredient, to take back to his restaurant, for a very fair price. As you walk further inside, you realise that Machane Yehuda is a maze for traders and shoppers alike; at each corner proudly sits another stall selling freshly baked bread and biscuits, spices and dried herbs of every variety and rows of large domes of halva, a Middle Eastern sweetmeat made from tahini paste and flavoured with chocolate, pistachios and vanilla. Further on and tucked away inside a covered stall, stands the large machine itself, grinding away at kilos and kilos of seeds, spewing out the thick sesame paste into an iron casket, ready to be sold in the branded tubs that line the stall. Further down is a busy fruit and vegetable stall that entices you in to their covered area where more and more of this wonderful fresh produce sits. I walk past the purple tinged artichokes, large red vine tomatoes and small green cucumbers before coming to a mound of light green round vegetables with tentacles that remind me of the tripods from Jeff Wayne’s War of the Worlds. It is in fact Kohlrabi, a member of the cabbage family and translated literally means ‘turnip cabbage’. I find myself questioning a familiar accent about this vegetable and I am soon told all about its delicious sweet flavour with a natural crunch, together with its healthy properties as well as how it is usually served; fresh in a salad a rather than cooked. I was even given a recipe to make ‘coleslaw’ with kohlrabi, beetroot, carrot and celery, tossed in a light dressing of olive oil, lemon juice, salt and pepper…..delicious! Every corner of this street is filled with people, either buying and selling food or eating and drinking in a corner bar or cafe. The noise is of a raucous party and the smell of the espresso coffee is pungent. There is nowhere I can liken it to, it has such a distinct atmosphere; one of compulsiveness and indulgence as well liveliness and excitement, when everything is so fresh and exuding flavour; this is the only place in Jerusalem to buy food.